Winco WDM005-202 Ardesia Elista Melamine White Triangular Bowl 8"
TigerChef > Dinnerware > Melamine Dinnerware > Melamine Serveware > Melamine Bowls >< Melamine Serving Bowls > Winco WDM005-202 Ardesia Elista Melamine White Triangular Bowl 8"
$108.43 Winco WDM005-203 Ardesia Elista Melamine White Triangular Bowl 9"
$132.11 Winco WDM005-204 Ardesia Elista Melamine White Triangular Bowl 10"
$88.73 Winco WDM005-205 Ardesia Elista Melamine White Triangular Bowl 11"
$135.59 Winco WDM003-202 Ardesia Hailey White Melamine Angle Bowl 14"
$55.13 Winco WDM006-202 Ardesia Akila Melamine White Trio Bowl 7"
$3.52 Vollrath 52870 Black Melamine Round Serving Bowl 34 oz. 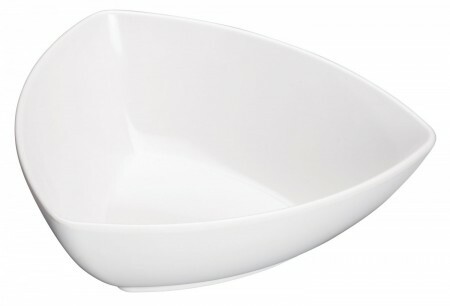 A stylish addition to any dinnerware collection, the Winco WDM005-202 Ardesia Elista Melamine White Triangular Bowl 8" adds modern elegance to any setting. Perfect for serving appetizers, entrees, and more, this NSF listed bowl boasts a contemporary triangular shape that allows for plenty of plating options. This smooth, pristine white bowl resembles delicate ceramic and beautifully frames food, highlighting its colors and textures. Combining style and unbeatable durability, this triangular bowl plate is made from high quality break-resistant melamine.